Rail Explorers: Las Vegas Division is open January through April. Tickets available now. Rail Explorers: Las Vegas Division is presented by the Nevada State Railroad Museum in Boulder City NV. The Las Vegas Division offers an exciting tour which combines our pedal powered explorers and a ride on a historic train! 'The Southwest Ramble' - is an exhilarating 4 mile downhill pedal powered ride from the station to the park at Railroad Pass. Bring a snack and a drink to enjoy during the 30 minute break at our rail-side picnic area. Then, enjoy a ride back to the top of the hill in one of the Museum's historic trains (included in ticket price). Please allow 1.5 hours for this tour. NEVADA RESIDENTS RECEIVE 'LOCALS DISCOUNT' Present your Nevada State ID and get 15% off! Rail Explorers: Las Vegas Division bookings are now open. Book your tour now! Catskills Division - opening day May 18, 2019 - reserve your tickets now! Join us in New York's Catskill Mountains to discover the rails that run alongside the Esopus Creek from the beautiful village of Phoenicia. Ride the new Rail Explorers fleet of rail bikes, now with electric pedal assistance! 'The River Run' - Experience the magic of the historic Ulster & Delaware Railroad as you travel alongside the Esopus Creek through the beautiful woods of the Catskill Mountains. Bring a snack and a drink to enjoy at our creekside turnaround. This is an 8 mile round trip with electric pedal assistance. Please allow 2.5 hours. Seats are limited so book early to make sure you don't miss out. Rail Explorers: Catskills Division bookings are now open. Book your tour now! Rhode Island Division - opening day May 11, 2019 - reserve your tickets now! The Rail Explorers: Rhode Island Division is presented by the Newport and Narragansett Bay Railroad. Enjoy an unforgettable scenic ride along historic Aquidneck Island and spectacular Narragansett Bay. 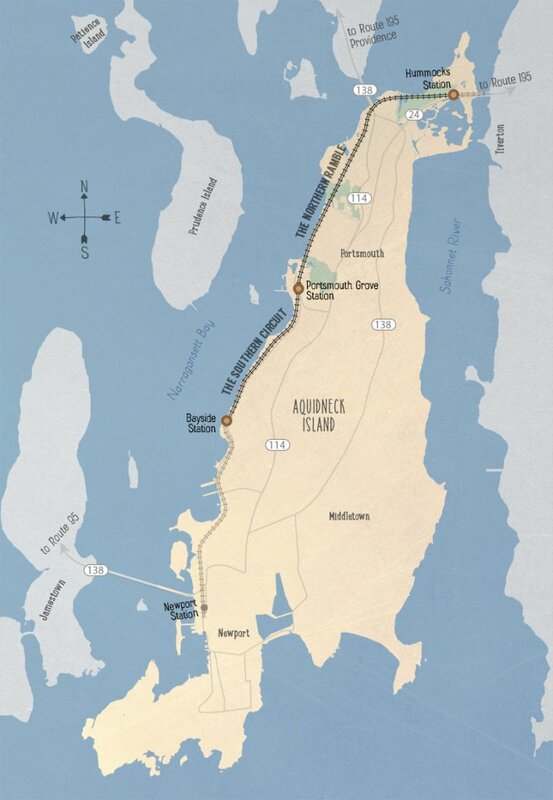 'The Northern Ramble' - a six mile exploration of the historic railroad between Portsmouth and the Sakonnet River. One way tour with shuttle bus. 'The Southern Circuit' - a six mile round trip tour (3 miles out, 3 miles back). Bring a drink or a snack to enjoy during a 30 minute break at Bayside Station, our exclusive waterfront picnic area, before riding back to the station. Rail Explorers: Rhode Island Division bookings are now open. Book your tour now! Parking and check in for all tours: 1 Alexander Road, Portsmouth, RI.